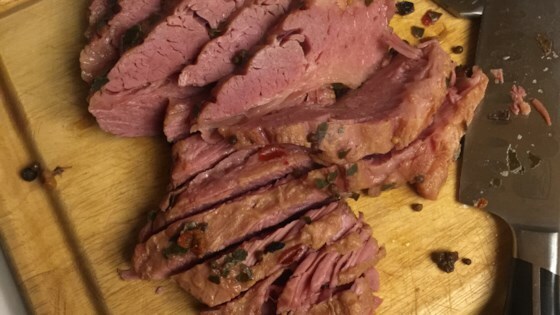 "This method of cooking makes the most tender, flavorful corned beef brisket that you will ever eat! Cooking time does not include the time for the pot to reach the proper pressure and to release the steam. Cutting the finished brisket with an electric knife makes for beautifully cut meat." Place brisket fat-side up on a rack inside an electric pressure cooker. Sprinkle garlic powder and onion powder over brisket; pour beer into the pot. Seal pressure cooker and cook beef on the "meat" setting according to manufacturer's instructions, about 1 hour 30 minutes. Allow pressure to release naturally according to manufacturer's instructions. Transfer brisket to a cutting board. Remove top layer of fat from the brisket. Slice across the grain using an electric knife. I'm just experimenting with a new pressure cooker. This made a very good brisket. I like a little crust, so after pressure cooking, put it under a brioler for about 5 minutes on each side. Very good and not overdone. I must admit I didn't like the beer flavour, but that may be because I used a stout. Next time I'll try an ale. Nice tender meat. Was an excellent recipe. Even the grandkids who normally don't like anything "different" enjoyed it. Turned out AMAZING. So much more tender than in the slow cooker.